Erin has made telling stories about food her profession. You can find those stories in Food & Wine, LA Weekly, Serious Eats, Robb Report, Complex Magazine and LIVESTRONG.com. Did we mention she's an Angeleno? Third generation, players. 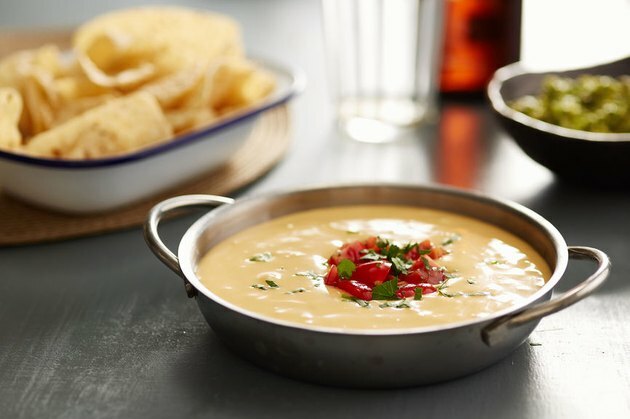 It's kind of hard not to love queso. The Tex-Mex staple is zesty, creamy and addictive. But can you still get your queso fix if you're vegan, lactose intolerant, or simply trying to eat healthy? Sure you can thanks to this irresistible vegan queso recipe. Instead of fake cheese, the base of this queso features roasted eggplant, cauliflower, and cashew milk. Eggplant and cauliflower are both low in calories, but rich in dietary fiber, vitamins, and minerals. The flavorful cheese dip is seasoned with Vitamin B12- and protein-rich nutritional yeast, along with garlic, cumin, liquid aminos, cayenne and paprika for some heat, and anti-inflammatory turmeric. Given that one serving of this queso has only 53 calories and 2 grams of total fat, we also encourage you to make this queso on any ole weeknight and eat in while binge-watching Netflix. Go ahead and live your best life, you deserve it.